An easy and pain free 120 lbs lifted 8 times at the age of 74. What happened to his tongue is analogous to what happened to much of his body. The brain tumor caused the loss of sensation and control (sensorimotor function). Particularly the right abdomen, hip, and leg were affected. Like the left half of his tongue, these muscles grew weaker and atrophied when they lost input from the brain. 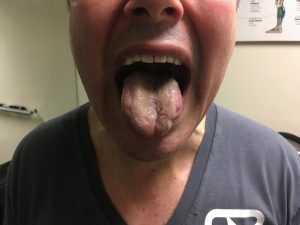 Like the right half of his tongue the rest of his body that was unaffected began to compensate but the resulting asymmetry led to back and hip pain. You can read about my story by clicking here, including overcoming back pain and an endocrine tumor. I’ve been able to take what I’ve learned helping myself and have been fortunate to be able to help many people who have been suffering from chronic pain that persisted for years. Now to be clear, I never do anything outside of my scope of practice as a personal trainer. I don’t play physical therapist—I collaborate with them. I’ve never made any claim about being able to help anyone cure their pain. Especially, because I respect the complexity and individual nature of pain as well as the potentially many interacting factors that can contribute to chronic pain. And not everyone gets amazing results and I have definitely made mistakes. 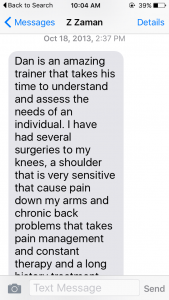 That being said, many of my clients have seen multiple doctors, physical therapists, and had other personal trainers before me… And their pain remained (and on occasion was even aggravated). I have earned their trust because I know how to work with them. Meet them where they’re at and push them just enough, and much of the time they feel a lot better. No pain no gain is BS– Exercise is about making progress not soreness. It’s about improving life quality and longevity not killing you. My clients say they almost always say they feel better after our workouts than they did when they came in. 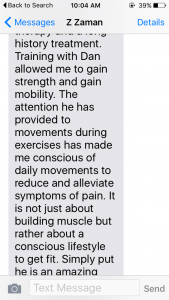 So at the very least I feel safe claiming that I’m damn good at improving fitness qualities (like strength, mobility, and balance) without aggravating pain. This is important in and of itself, but can also potentially lead to pain reduction in some cases. This improvement might be because of the nonspecific pain relieving benefits of exercise, improving muscle balance and posture, altering input to the nervous system, improving movement quality, or whatever proposed mechanism(s). The only thing I will tell you for sure is that you should never give up, because even after you’ve tried everything— you haven’t. Would you like to see your life transformed in the way that many of my personal training clients have experienced? 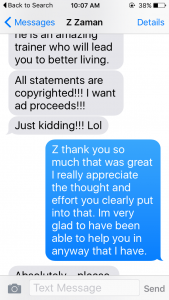 I can’t guarantee that I can help you, but I can promise to try my best and you might find that you make more progress than you believed possible. The average person I work with is between the ages of 45 and 75. Some common issues I’ve helped people work around or improve include: cervical and lumbar disc herniations, spinal fusion, hip replacement, shoulder replacement, rotator cuff tears, frozen shoulder, meniscus injuries, and a host of other problems. My unique approach integrates select concepts and techniques from disciplines including: traditional strength training, yoga, Pilates, neuroscience, as well as ideas from a long list of physical therapy, exercise, and rehabilitation experts you’ve never heard of. I use what works and discard what is useless (and I steal from Bruce Lee). Your current health/fitness level and any future progress (or regression) are largely the product of your lifestyle. Your lifestyle is so key, that I educate my clients on a variety of subjects including the neuroscience of pain, behavioral psychology (how to form/break habits), posture, ergonomics, nutrition, non-exercise physical activity, improving sleep, natural hormone optimization (through circadian regulation), as well as sport and activity specific information.